Lucky the Carp has become quite the superstar fish in the Prairie du Chien community, so much so that he’s the bright-eyed, smiling face of the annual Carp Fest. He’s a world-famous, friendly symbol of the river, of fun times with family and friends, and of good fortune for the coming year. 2015 is the 15th year of this annual winter festival in Prairie du Chien. “Time flies when we’re having fun,” said Tom Nelson, co-coordinator who, along with his wife Cathie, had the original idea that started Carp Fest. “Here we are in the Midwest, with an outdoor activity, at midnight, and we’re celebrating an iconic carp. That’s the uniqueness of it, and that kissing Lucky signifies bringing luck in the new year.” “It’s hard to figure out a way in the middle of winter to get people outside,” Prairie du Chien Parks and Recreation Director Mike Ulrich added. “The partiers come out for this but also the families. 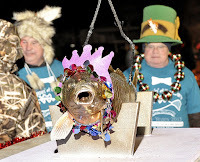 It’s a lot of fun.” Carp Fest provides so much distinctive amusement that “Travel Wisconsin” magazine has recognized it as one of three “Quirky Festivals” worth attending in the state this time of year. “They obviously felt we were good enough to be on their statewide front page,” Ulrich said. Of course, it all began 15 years ago with the Droppin’ of the Carp, an idea spun from the many other New Year’s Eve celebrations across the nation. Then, six or seven years ago, Ulrich approached Nelson about making the carp drop into more of a holiday celebration, and Nelson agreed. “Without the evolvement of Carp Fest, the Droppin’ of the Carp wouldn’t be what it is today,” Nelson commented. “The activities that lead up to it really highlight it.” In its 15th year, a few new things are in store for event-goers. The Early Bird Droppin’ of the Carp Party is one such affair on New Year’s Eve, from 6:30 to 9 p.m. at Hoffman Hall, with the first drop of the night happening at 8:30. “I wondered what we could do for people who don’t like to be out in the cold,” Ulrich explained. “It’s also a place where people who go to bed early can come and see the new Lucky. We’ll have food, games and music.” Certainly, those who attend the early bird festivities are also encouraged to stay up past midnight and take part in the activities at Lucky Park. At the formal carp drop, there will be snowmobile rides provided by the Cliffhangers Snowmobile Club (if there is snow) and a pyrotechnics show and huge bonfire, as usual. Carp samples will be available for tasting as well. Around 2,500 to 3,500 people are expected to fill up the park, spilling out into the streets, around midnight for the official Droppin’ of the Carp. Alongside the Nelsons and Ulrich, Carpmaster Shawn Redman will lead the festivities alongside King and Queen Kenny and Jan Meyer. Mayor Dave Hemmer will be there and, likely, some governmental dignitaries. In addition to the fun the night of the carp drop, Carp Fest actually kicks off on Saturday, Dec. 26, with youth ice fishing fun and snowmobile rides (if there’s snow/ice) from 9 to 11 a.m. at Washington Street Park. A low-cost family open gym and swim will be offered at Hoffman Hall, from 1 to 4 p.m. (Saturday through Thursday). Then, from 4 to 6 p.m., there will be a lit trail/sledding hill and bonfire at La Riviere Park—rain (snow) or shine. On Sunday, Dec. 27, there will be a disc golf tournament at 10 a.m. at St. Feriole Island. All are welcome to participate. On Monday, Dec. 28, a euchre tournament is open to the public, from 1 to 4 p.m., at city hall. “A lot of people show up for euchre. Last year, we brought in extra tables. We give cash and prizes,” Ulrich said. On Tuesday, Dec. 29, a bowling party will highlight the day, from noon to 3 p.m. at Leisure Time Sports Bar and Bowl. The bowling alley is usually packed for this family-oriented activity. Wrapping up the week will be the Early Bird Droppin’ of the Carp Party, beginning at 6:30, and the official Droppin’ of the Carp at midnight. A New Year’s Day Rotary Breakfast will cap the festival from 9 a.m. to 1 p.m. at Huckleberry’s Restaurant. So bring your friends and family and come together with the rest of the community for New Year’s and this year’s Carp Fest. A kiss or not, may Lucky bring you the best of luck for 2016.